Greenbrier County native and local real estate agent Greg Allman has purchased a long time county business with the intentions of providing the same services. Despite moving from Ronceverte to Lewisburg and then to White Sulphur Springs, Allman and his wife Jill have not been tempted to leave the mountains of the Greenbrier Valley. Allman is in his 19th year of real estate. He decided to get into the business almost 20 years ago when he was in the process of purchasing his own home. Allman was interested in the process and wanted to understand it further so he pursued his real estate license. Allman took the real estate course while working as a stylist at the Esquire salon in White Sulphur Springs where he was mentored in many aspects by the late Don McCoy. After obtaining the required license to sell real estate, Allman worked as both a stylist and a real estate agent for 10 years. As for purchasing Greenbrier Real Estate Service, Allman saw owning the business as a good opportunity and he spoke with the previous owners R. Wellington and Hilda Johnson about purchasing the business. “An opportunity to join Wellington and Hilda doesn’t come along very often,” Allman said. Allman continued saying he never would have thought he would be doing this but he is happy things have turned out this way. “The area has taken care of me and I have been blessed with good clients. I couldn’t pick a better place to be than the Greenbrier Valley,” Allman said. Allman is appreciative to the Johnsons and says he is excited about this new venture. He is looking forward to serving previous and new clients at the new location at 107 North Court Street. Wellington Johnson got involved in real estate many years ago when he started out working for a lender doing real estate loans. Once his interest for real estate was perked, he decided to get his real estate license but never thought of owning his own business. 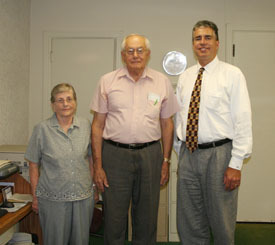 Wellington and Hilda Johnson purchased Greenbrier Real Estate Service from a friend of theirs and have operated the business for the past 25 years. “We’ve always enjoyed working with people, but we’ve operated the business for 25 years and we figured it was time for us to slow down. Greg is a friend in our business and we wanted to sell to someone who would operate in the same manner we did,” Wellington said.